Make your reservations! 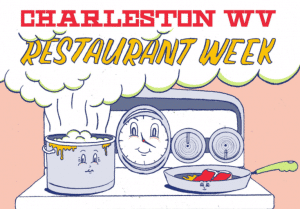 Charleston Restaurant Week, in its fifth year, will be held Jan. 29 through Feb. 3, 2018. Charleston Restaurant Week brings together residents of Charleston, visitors to the area, and this year, 21 independently-owned restaurants. Charleston Restaurant Week has become one of the most highly anticipated culinary events in Charleston and presents a chance to enjoy local cuisine and specialty menus at a single price point: a three-course dinner for $30. Six restaurants have participated all five years of the event: Bluegrass Kitchen, Ichiban, South Hills Market, Bridge Road Bistro, Soho’s at Capitol Market, and Paterno’s at the Park. They are being recognized as the “Five Timers Club,” and will receive a special designation for their status. .
Three restaurants, normally closed on Monday for service industry workers, will be open for Charleston Restaurant Week, and all restaurants will create their three-course menus within the next week. Many restaurants will feature longtime favorites, while others will test creative boundaries with new dishes. Diners are encouraged to use #CWVRestWeek in their social posts. When are the 2018 menus going to be published?